Driving a motor vehicle gives us independence, the ability to go at any time to wherever we wish and not have to depend on others or public transportation and the problems that those modes of transportation presents. Unfortunately, this feeling of freedom is instilled in us from the time we come of age, get our driver’s license and experience the thrill of driving and mobility. Seniors, or those who are 65 and over, have every right to drive and many continue to drive their cars well into their 80s and even 90s as they cherish their freedom and mobility as much as the rest of us. It is no secret, however, that reaction times, vision, judgment and other cognitive abilities diminish with age and motorists who recognize that take certain precautions when driving. For instance, numerous seniors report that they avoid driving at night, in bad weather or even on freeways. Others go out of their way so as not to make left turns, fearing traffic coming from their left and right. Most seniors however are good at planning a route, staying a safe distance behind vehicles and avoiding distractions while driving are other safety measures they follow. But for some seniors, recognizing and dealing with the infirmities and limitations of old age are ignored. Some with Parkinson’s disease, early onset of dementia, spinal cord problems and trouble with night vision may fail to recognize their restrictions and often risk their own lives and those of others when they drive. Who has not experienced or observed an elderly driver traveling 40 mph on a 65 mph roadway, constantly hitting the brake on a level roadway or not moving when the traffic light turns green. There are also the horror stories of older motorists mistaking the accelerator for the brake and plowing into pedestrians on a sidewalk or through a storefront window. Seniors also drive each other around so a passenger injury from a senior driving crash is not uncommon. In Massachusetts, seniors account for 20% of car accidents where the average stay in a hospital is 4 days, meaning that the victim suffered a serious injury. State law requires that motorists 75 and over take a vision test or provide a vision screening certificate at the DMV in order to renew their license. No one wants to put an age limit on driving since many seniors are very capable drivers, so this was seen as a compromise to ensure that they and other persons using the roadways are safe. 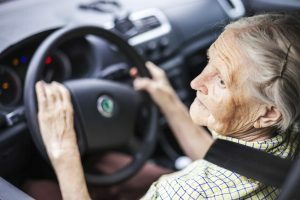 For seniors who continue to drive, they should consider having yearly vision exams and to see their provider if they are experiencing confusion, find themselves getting lost when walking or driving or have any doubts about their abilities. Their medications should also be checked to see if driving should be avoided because of side effects or if interactions with foods or beverages can affect driving. There are, of course, numerous safe alternatives to driving for senior citizens. Besides public transportation and cabs, there are ride-sharing opportunities like Uber and Lyft that can be less expensive than a cab ride and that offer discounted rides for pools. For seniors living in nursing homes or other facilities, shuttle services are often available. Some care facilities and hospitals are offering medical evaluations for those who have suffered strokes, spinal injuries, Parkinson’s or show signs of Alzheimer’s to see if their driving privileges should be restored since a medical clearance will be required. If not, the individuals are advised about programs where they can readily receive rides to whatever destinations they wish to go. If more than one driver was responsible, then claims against all of them may be made. The total value of your claim may be paid mostly from one driver, regardless of the degree of fault of that individual. You can, however, file for uninsured (UM) or underinsured (UIM) coverage against your own auto liability policy. If a responsible driver has no insurance or the party’s liability limits are insufficient to compensate you, then you can seek compensation pursuant to the UM or UIM provisions of your own policy, provided you purchased such coverage. You also have the option of filing for PIP or personal injury protection benefits regardless of who was at fault. If you have your own medical coverage, PIP will pay your first $2000 in medical expenses before your own policy applies. If not medically insured, PIP pays up to $8000 for medical costs and for up to 2 years after the accident. It also pays 75% of your lost wages up to the $8000 limit, which includes medical expenses as well. Contact Boston personal injury attorney’s Neil Burns & Roshan Jain if you are a senior or a passenger in a senior driver accident who was injured in an auto accident and need assistance filing a claim or in discussing your legal options. Burns & Jain have the decades of experience you will need if you suffered a serious injury and are facing challenges in your medical and mental outlook for the future. Contact him today for a free evaluation of your claim: 617-227-7423.